Pocket Heroes Adventure Beginning Soon! 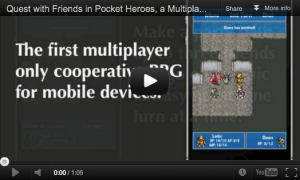 TouchArcade’s current top story confirms that upcoming multiplayer RPG for iPhone and iPod touch, Pocket Heroes, will launch on July 12! Here’s description of the game from the TouchArcade crew: “Pocket Heroes is often described as Words With Friends meets turn-based RPG, though that is probably best understood by watching the trailer we have below. It almost goes without saying, but the mobile-friendly points of design seem like the game’s coolest features and we can’t wait to give them a spin in the real world.” Check out the full article and prepare to begin adventuring with friends! Our hit addictive iOS puzzle game, Light Byte, has been receiving great acclaim from various sources. Apptudes.com describes it as “frantic iOS puzzling action” and awards a mighty score of 4.5 out of 5 stars in its review here. 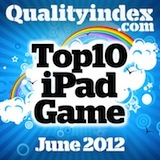 Meanwhile, QualityIndex.com placed Light Byte into its list of Top 10 iPad games! If you like the look of this game (created by genius indy developer Steven Pastro), you should dive in and try Light Byte for yourself now.